Fears of a global financial meltdown have grown as the world’s biggest bankruptcy plunged global markets into turmoil. Investors were left reeling as the abrupt demise of the Lehman Brothers investment bank sparked the biggest shake-up on Wall Street in decades. Shares fell as fear spread through the financial system. Central banks unveiled urgent measures amid concerns that the world economy was entering a dangerous new phase. The 5,000 Lehman staff in Britain was clearing their desks in the country’s biggest single loss of jobs. The majority of the bank’s 26,000 staff around the world were seen losing their jobs. Lehman was felled by the weight of about $60 billion in toxic bad debts. This was the entire scenario which was the indicator of the most threatening economic upswing all over the world. RBI’s new governor D Subbarao promised to take quick actions in case of liquidity constraints. He also said that RBI had taken many measure to increase the dollar liquidity like easing of external commercial borrowing (ECB) norms, raising NRI deposit rates and allowing banks to borrow from their overseas subsidiaries and branches. It was an unexpected move by the government of India to appoint its Finance Secretary Duvvuri Subbarao as the Governor of Reserve Bank of India. Subbarao took over from Y. Venugopal Reddy, the previous governor on 5 September 2008. His term as Governor will end in September 2011. He is the twenty-second Governor of Reserve Bank of India (RBI). Subbarao has wide experience in public finance and has held important posts in this area. Duvvuri Subbarao was born on 11 August 1949 in Eluru, a small town near Vijayawada, Andhra Pradesh. He did his schooling from the Sainik School in Andhra Pradesh. 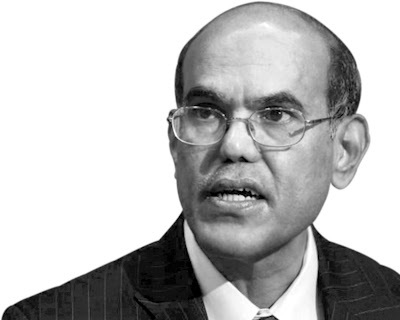 After joining the IAS, Subbarao worked as the joint secretary in the Department of Economic Affairs, Ministry of Finance, Government of India between 1988 and 1993. Subsequently he became the Finance Secretary to the Government of Andhra Pradesh between 1993 and 1998. On completion of his term, he was deputed as lead economist in the World Bank from 1994 to 2004. On completion of his term, he was appointed to the Prime Ministers’ Economic Advisory Council from 2005 to 2007 before he was elevated as the Finance Secretary in 2007. The new RBI governor took over at a time when India’s annual rate of inflation was ruling at a 16-year-high, even as the country’s economic growth has slowed down to 7.9 per cent for the first quarter as opposed to 9.2 per cent for the corresponding quarter last fiscal. 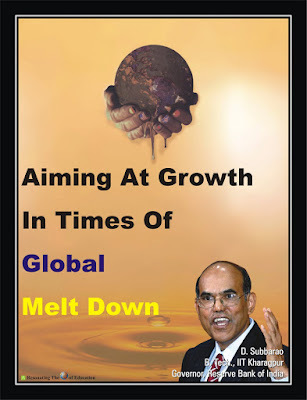 After taking the position of Governor Reserve Bank of India (RBI) Duvvuri Subbarao stated confidently at his first news conference that for sustained economic growth, it is essential that inflation and inflation expectations be contained. The current high level of domestic inflation reflects a combination of supply-side pressures as well as demand-side factors. The RBI also said it aims for wholesale price inflation to fall to about 7 per cent by the end of the fiscal year in March 2009. On the measures that have been initiated by the RBI, Subbarao said the intent of the RBI was three-fold – to maintain a comfortable rupee liquidity position, to maintain a comfortable foreign exchange liquidity position and to ensure that credit continues to flow to productive sectors. India’s inflation slowed to a nine- month low, giving the central bank room to cut interest rates further to support a faltering economy. In Just 27 days from October 11, the Reserve Bank of India (RBI) infused cash in the banking system equivalent to 3% of India’s Rs 53,31,480 crore gross domestic product estimate for this fiscal year. The liquidity infused now Rs 1, 80,000 crore is Rs 20,000 crore more than what the central bank had mopped up. The flood of cash is around 78% of the government’s total plan expenditure of Rs 2, 05,100 crore for this fiscal. This greased the credit market that had frozen after the collapse of Lehman Brothers in September 15, and helped the overnight call money rates to fall from 20% on October 10 to 5.25% on December 30 at the Mumbai interbank call money market. The government decided to spend an extra Rs 20,000 crore this fiscal, besides concentrating on efficiently spending Rs 300,00 crore before March to stimulate growth. The decision to cut taxes and spend extra throughout the fiscal to boost the economy is equivalent to another 2% of India’s GDP estimate, as per the finance ministry. The central bank took additional steps to make short-term loan cheaper. It reduced the rate at which it gives short-term loans to banks (Repo) by 250 basis points in just 43 days between October 20 and December 8. India’s central bank moved, in the month of November slashed its key short-term lending rate or Repo rate by 50 basis points to 7.5 percent and banks’ cash reserve requirement (cash reserve ratio or CRR or the proportion of deposits banks need to keep with the central bank) by 100 basis points to 5.5 percent to maintain financial stability and ease the credit crunch that has roiled the domestic financial market. He is married to Urmila Subbarao, also an IAS bureaucrat of the 1975 batch Subbarao has two sons named Mallik and Raghav. Like their father, both of them are IIT alumni. He did his bachelor’s in Physics from Indian Institute of Technology, Kharagpur (class of 1969) where he was the recipient of Director’s Gold Medal. He then completed his master’s in Physics from Indian Institute of Technology, Kanpur. After graduation, D Subbarao became an Indian Administrative Service (IAS) officer of the Andhra Pradesh cadre and topped the 1972 batch। Subsequent to joining the IAS he did his MS in Economics from OHIO state university (1978) and was a Humphrey fellow at MIT during 1982-83. He has Ph. D. in Economics from Andra University. CRR is Cash Reserve Ratio. It is the ratio of deposits which banks have to keep with RBI. When you deposit Rs 100 to your bank, bank gets Rs 100 and now can use this money to lend others, but they have to put some part of it with RBI , if CRR is 8% , they will have to deposit 8 with RBI and they are left with Rs 92 . So when CRR is decreased, Banks are left with more money to lend and when its increased they are left with less, even though 1% decrease in CRR leaves bank with 93 instead of 92 , this Rs 1 is big enough thing . When you take loan from some bank you pay interest for that, in the same way , these banks also take short term loans from RBI , and the interest RBI charges from them is called Repo rate . So if Repo rate is 9%, and some bank takes loan of Rs 100 from RBI, they will pay interest at the rate of 9%. Repo Rate is also linked to the interest we pay for loans from Bank. Banks need to charge more interest than they are paying, so if Repo rate is 8%, they will charge more than 8% for loans which they give, If Repo rate comes down, banks may also consider the interest rate they charge us. How do Repo Rate and CRR help to ease Inflation? Repo Rate: When Repo rate is increased, the banks can have to pay higher interest to government and they also charge higher interest from common public which gets discouraged to take more credit from banks, because of which there is less supply of money in system and there is less Liquidity? CRR : Its easy , if CRR is increased , banks have to deposit more money in with the bank and it results in less money creation in economy , and hence people have less money to buy things and they will think twice before paying higher price for something . In this way one can say Repo Rate and CRR are two tools which RBI uses to control the liquidity in country and as Inflation is linked to liquidity, it can be controlled to a great extent.